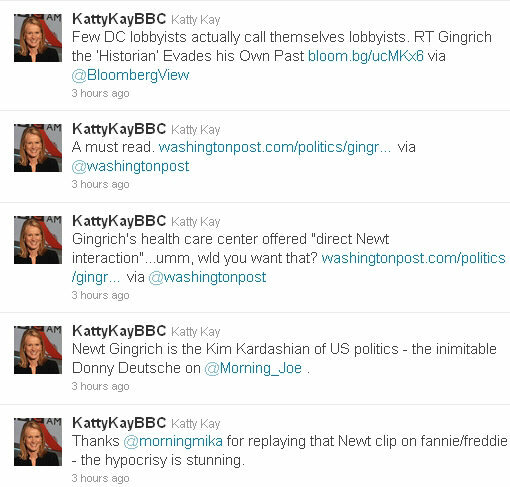 No laziness from Kay earlier today – she fired out five tweets in a row all attacking Newt Gingrich. Meanwhile, the BBC continues to look the other way when it comes to America’s biggest ever crony capitalist. Katty is surprised her Left-wing media buddies haven’t given the President’s stupid remark more attention? It’s gotten plenty of attention in the non-Left media. Which she doesn’t read. Also, the President isn’t a Crony Capitlist: He engages in Crony Corporatism. Isn’t the current term ‘Venture Socialism’? I like that phrase, very accurate description. I know – a BBC US journalist not having a clue about what’s going on in the right-leaning media! Who’d a thunk it? I noticed that Katty RTed the story from the JournoList-infested Politico, and not from the The Corner (National Review Online) or Breitbart or TownHall or Hot Air. The Beeboids never RT anything from the non-Left. Speaking of Katty’s tweets, here’s one where she thanks a group for the nice reception she got at a speaking engagement. What she’s really thanking them for is allowing this daughter of the elite, this One-Percenter, to accumulate even more wealth, thus creating more income inequality, by taking a nice fat fee for speaking at a women’s event. Which she does regularly, trading on her status as a Beeboid. She’s a top-flight hypocrite, and uses her BBC position to enrich herself, just like so many others do. Those tweets sure show which side KK is coming from. How can they claim objectivity when thewy reveal their own strong views so clearly ? The tweets seem to be simply designed to stay in with the liberal crowd over there. Another cheerleader for Obama is Chris Matthews – famous for “Obama sends a tingle down my leg”. He hates the Tea Party with a vengeance. In this clip he has invited himself on to Larry Elder’s radio show, claims he is only a little left of centre – and then gets taken to the woodshed for his extreme partisan style. Newt Gingrich is noted for shoving the media’s leftie arguments back at them. I’d love to see him put the snide KK right. Unfortunatley, during his appearance at the BBC College of Journalism, Mark Mardell revealed that they believe Twitter to be outside the rules. So, unless it’s an egregious insult or something sick or violent, they can say whatever they like and get away with it. The only solution is to keep collecting these as proof that they are all Left-wing, and that personal biases are reflected in their reporting. And yet the BBC puts the most recent tweets from Mardell and Kay on its BBC US & Canada page. And both of them have “BBC” in their Twitter names. The “and yes, black, family” is so condescending it grates my teeth. And just what is a “cute” family, exactly? Can I make a suggestion? Is there anyway we can get the Twitter feeds of beeboids fed direct to this site? I don’t know if it’s possible to have them as a ticker or something? Would be really useful I think. Here’s one list of BBC Twitter feeds provided by the BBC itself. You could bookmark that for starters. Adding a sidebar feed is above my pay grade (and would it affect the blog’s loading time?) I’m reluctant to provide a full list of Beeboids becaue I want to catch them out! Sean Hannity will be discussing the $1.4bn bailout given to Greg Palast’s mate RFK Jr after Rush Limbaugh’s show in half an hour (8pm GMT) if anybody is interesed. Listen here (scroll down and click on the big Listen Live button). Maybe the BBC will get more interested in BrightSource once they find out it’s the parent company of an Israeli firm. They hate it when the US give money to the Zionist Entity. No JFKjr/Brightsource on Hannity so far – think I may have mistaken a previously-on-Hannity bit for what I thought was a trail for today’s show. Still, always interesting to get a different perspective on things. No – I was right first time. Coming up in the final hour along with Solyndra. I wonder if BBC-Democrat, and tweet-happy one-liner KAY, will politically expose the haters of Israel and Jews on student campuses? Katty is the daughter of a Foreign Office mandarin. She’ll agree with the students. Gingrich is getting a poll bounce hence the angry attention from Katty Kay and the rest of MSM. If he sustains his status as a potential challenger to Romney the attacks will become ever more aggressive. Can’t wait to see what Justin Webb will have to say – he really hates Gingrich. I’m no fan of Gingrich either, but the hypocrisy of Katty Kay calling him out for hypocrisy is stunning. I know what you mean – I fear the levels of hypocrisy involved in Kay’s tweet could, like a Swiss neutrino, jeopardise the known laws of the universe. There’s so much to hate about this loathsome woman, but I find it difficult to look past her name. A grown woman calling herself ‘Katty’? What an insufferable twot.